Shale shaker is a basic part of oil drilling system. Now, Aipu solids control will give buyers and users some professional tips about shale shaker. Knowing how to install shale shaker is very necessary. In general, the installation mainly involves four steps. 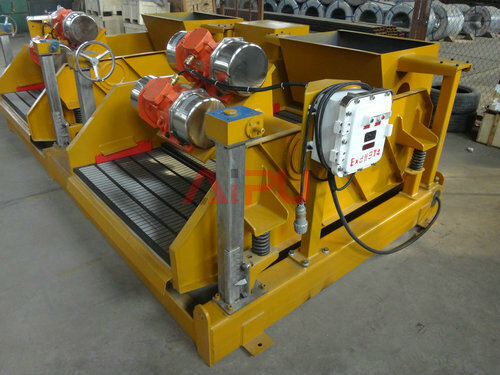 Shale shaker often have more than one layer, and this will be different according to customer’s need. On account of this fact, screen can be used along or work with other screen. It is also important to know how to install and replace the screen because screen play a significant role in shale shaker and whether the screen is installed suitable can influence shale shaker’s life time. If you need to fix the screen, you can apply for the bolt stretching device. When choosing the place to install the shale shaker, select somewhere is horizontal and the machine and place firmly to avoid sliding. When transporting the screen, you should fix it tightly to avoid damage. When installing the shale shaker, please remember to adjust the dip angle of the mud gun. It can be changed according to your requirement from -1° to 5°. Expects recommend that the size of screen should be chose appropriately, and the covering cloth of the device should have a total length of more than 70%. When you are washing the screen cloth, you can stop the whole cleaning for a short time. Pay attention to the direction of shale shaker rotation. Have a daily checking to make sure the drilling fluid doesn’t stream when it’s working. The tightness of the screen cloth should also be check every day. In order to let the screen work longer, you can spray some water on the surface of the shaker sometimes, and help to wash away some very small material on the cloth. You should be extremely careful because the particle may stick together and become quite big if the screen has been used for a long time. The above are some professional tips about how to install and use shale shaker in oil drilling, with professional tips you can largely extend its service life and improve its working efficiency. Aipu shale shaker use the double automatically simultaneous principle design, shaker deck with heat treatment make linear motion movement. Some spare parts are changeable with international brand. Aipu solids control also provides the shaker screen replacement, oversea service and spare products for you equipment or project.